These Banana Walnut Brownies are moist, fudgy, and delicious. They are very easy to make – great for a last minute dessert that everyone will love. 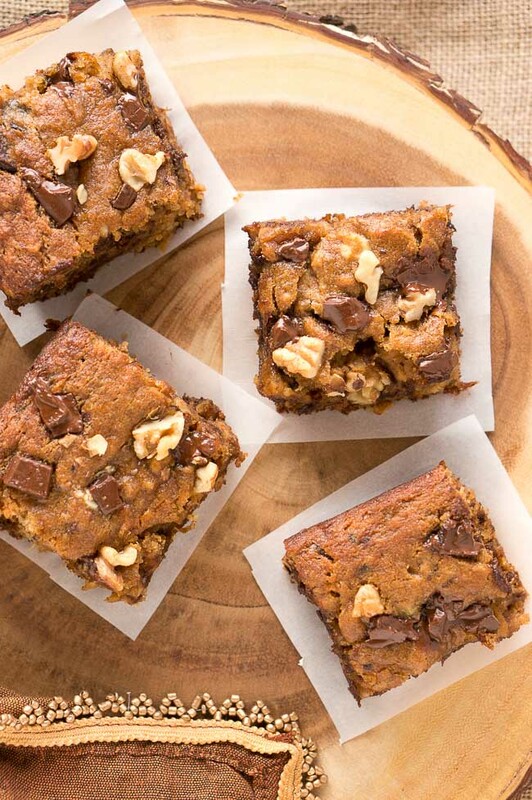 Looking for the perfect gluten-free banana walnut brownie recipe? These homemade brownies are gluten-free, Paleo, flourless, dairy-free and grain-free. 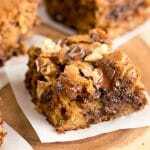 They are made with bananas, eggs, coconut flour, chopped walnuts and chocolate chunks. 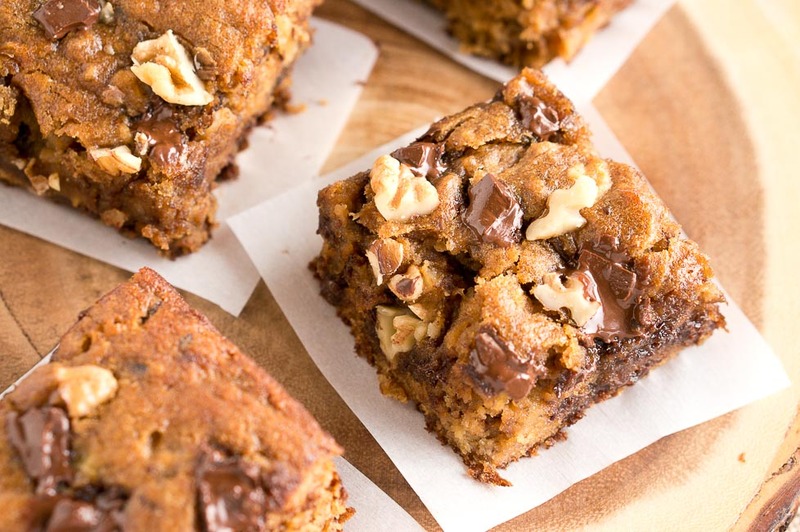 This recipe will become your new go-to recipe for gluten-free banana brownies. The brownies are fudgy, moist and so delicious! In this recipe, I use a combination of almond butter and only 1/4 cup of coconut oil. This makes the brownies somewhat healthier. I hate food waste and try to eliminate it as much as possible but sometimes it’s inevitable. The average household wastes 1300 pounds of food per year – up to $1500 in waste. Let me introduce you to the Vacuvita One Touch Storage System – it’s the perfect solution to this problem! 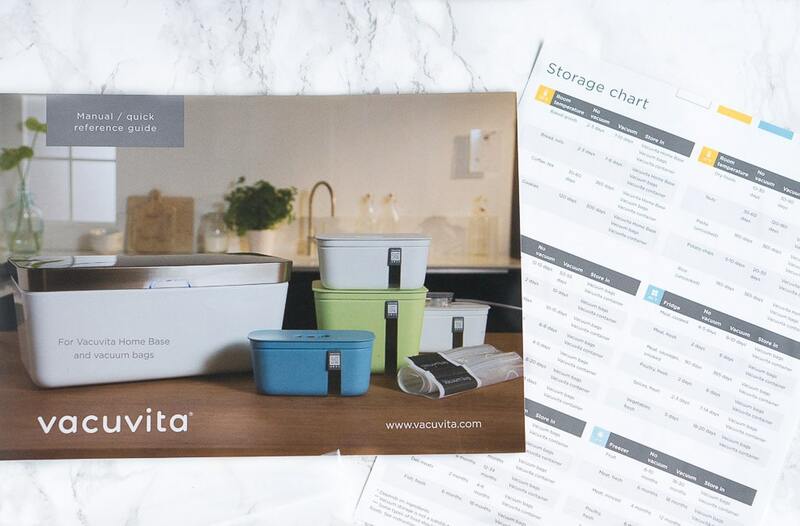 Vacuvita is a company that focuses on fresh food and storing food in a better (and prettier) way. Enjoy food up to 5X longer, opening a world of storage and prep options that significantly cuts back on waste. 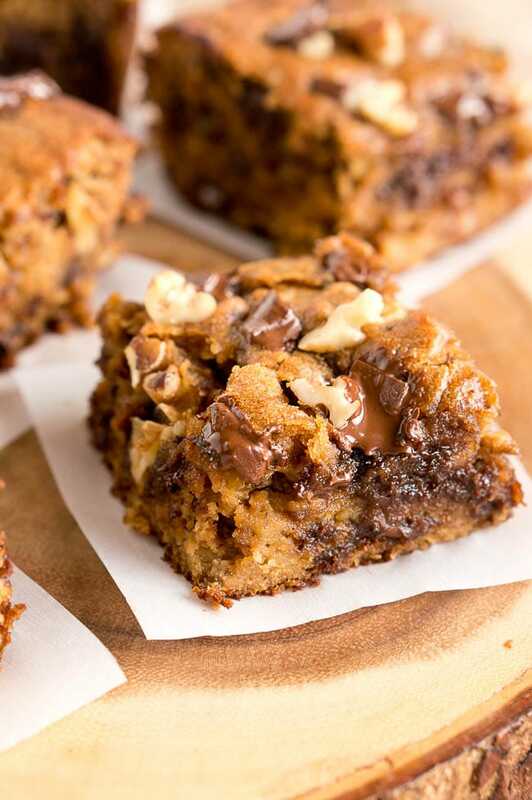 If bananas are going bad, I can usually make banana muffins or these banana walnut brownies. But what about other food that just doesn’t have a very long shelf life? 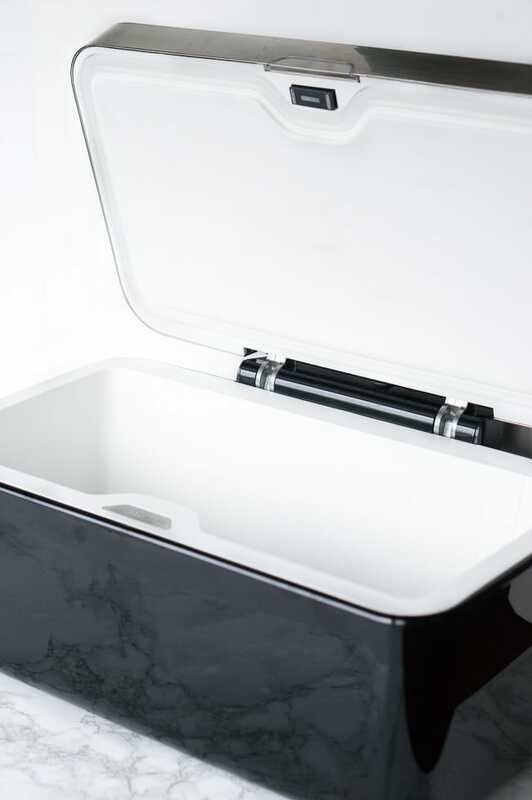 The Vacuvita is great for storing foods and extending their shelf life, and thus reducing food waste. Isn’t this brilliant! Yes, it is, and I am happy to share with you this new product that will help you save money by reducing food waste. You can also win this beautifully designed and easy to use vacuum storage system if you enter the giveaway below. The Homebase is great for storing dry food – bread, crackers, cookies, baked goods, coffee beans, keeping them fresh for a long time without the loss of flavor. The vaccum containers can be used to store fruit, nuts, pasta, and cookies. 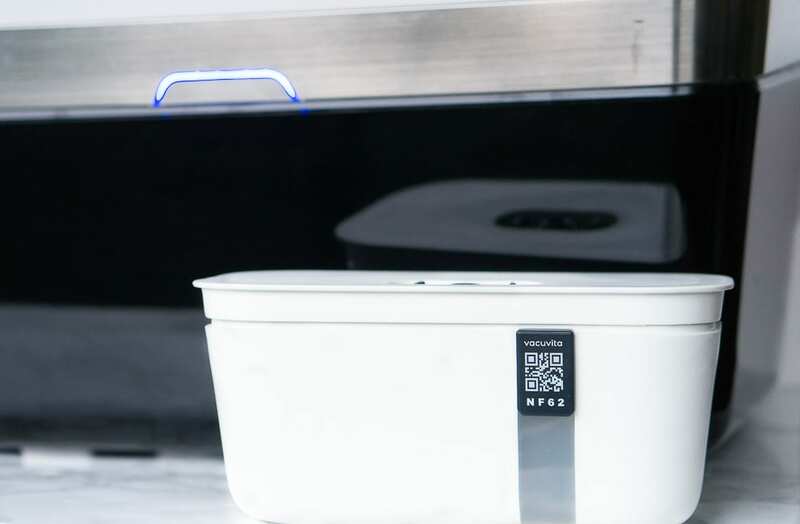 The containers are freezer-, refrigerator-, and microwave-safe, so they are perfect for storing leftovers, soups, or pre-cooked meals to eat at a later time. Unfortunately, berries don’t last very long, and a lot of times I have to throw them away because they went bad before I could use all of them. Now, with the Vacuvita, I store the berries in the small container and keep it in the fridge. So convenient, and they last so much longer. You can also use them to marinate meat. Usually, it can take several hours for marinating meat, but with the Vacuvita containers, you can marinate them in only about 20 minutes because the vacuum helps to open the pores of the meat, poultry, fish, allowing the marinade to get absorbed more quickly. The vacuum bags are great for storing meat, fish, poultry in the fridge or freezer. You can also store hard cheese and coffee beans. 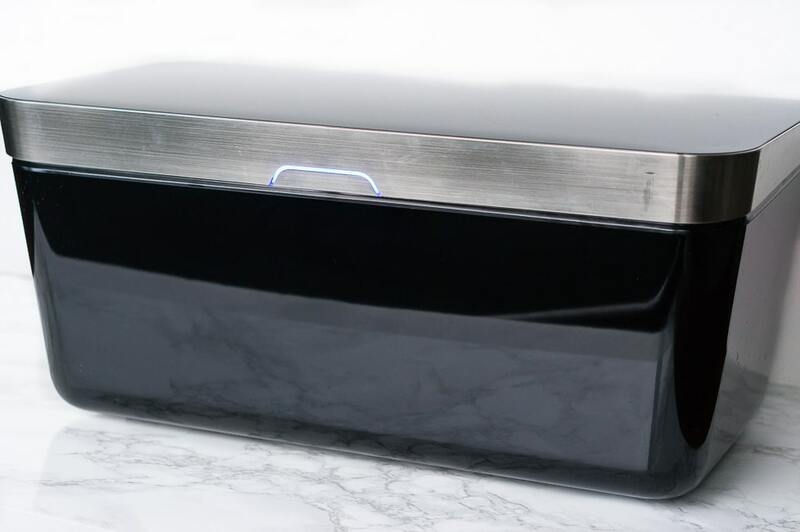 The bags also protect food from freezer burn, and you can also use them to sous vide. I love that you can keep track of what you have in your freezer and when you put it in there, and when it expires. You can do all of this with the Vacuvita phone app. How many times do you put a frozen chicken in the freezer and a month later you have already forgotten about it, or you forget what it’s in it, or when you placed it there? With the Vacuvita app, when food is nearing its shelve life I get a message so I can consume it before it expires. This helps me plan better my meals, and again reduce food waste. Wash, clean and dry fresh fruits and vegetables before vacuum sealing in bags. Don’t store bananas, soft cheese, mushrooms, garlic, onions, potatoes or cruciferous vegetables under vacuum. The Vacuvita FAQ page has a food chart and more information. 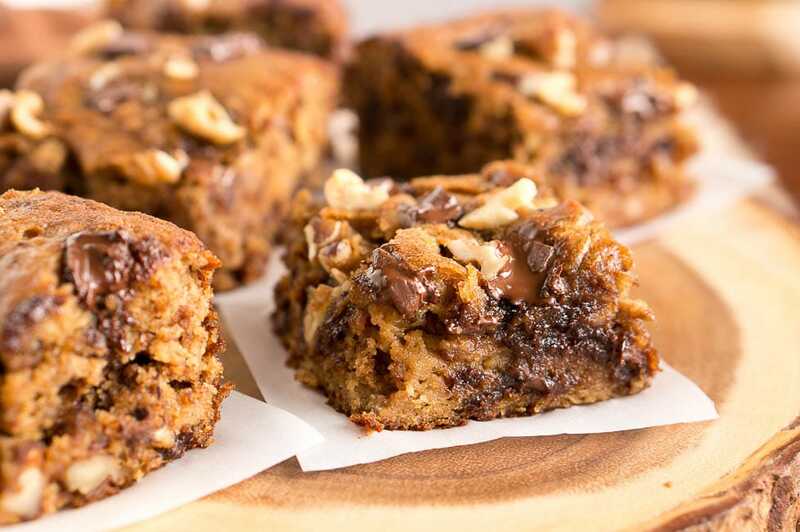 Delicious and fudgy Banana Walnut Brownies (Paleo). Preheat the oven to 350ºF. Line a 8 x 8 " baking dish with baking paper. In a large bowl, combine the mashed bananas, eggs, coconut oil, nut butter and vanilla extract until fully combined. Add the coconut flour, coconut sugar, baking soda, baking powder, cinnamon and sea salt to the wet ingredients and mix well. Fold in the chocolate chunks and chopped walnuts using a spatula. Reserve some of the chocolate chunks & chopped walnuts for later. Pour the batter into the prepared baking dish. Top with the reserved chocolate chunks and walnuts. Bake in the preheated oven for about 25 - 30 minutes. A toothpick inserted into the center should come out clean. Remove from oven and allow to cool on a wire rack for about 10 minutes before cutting the brownies. This post is sponsored by Vacuvita. I received a free product in exchange for a product review. All opinions are my own. I ,like that there are also containers that you can use. I prefer that over the bags. I like this because I get so tired of wasting food. This will keep things air tight. I love how I can use it to help reduce my food waste! I like that the vacuum containers are freezer-, refrigerator-, and microwave-safe, because this makes it easier to store and reheat left-overs. I like how simple it is to use! It’s a lot easier than our current vacuum. One of the things that caught my attention is how you can store your berries and make them last longer. I have such a hard time at keeping any kind of berries good for at least a week to eat them, also with some of my veggies. Love how it helps you to prevent the waste of food. I though the app was such a nice addition to keep tract of what you have and expiration dates. Thank you for the opportunity. I will be trying your banana walnut brownies recipe. Those look and sound delicious, omg! I love that the containers are microwave, fridge and freezer safe- that is def needed. I am right with you on the berries issue.. I hate to waste food! I love that the Vacuvita extends the life of food, especially fruits! We have a plentiful garden and I absolutely hate to see things go to waste. I like that by saving food, I will save money. I love that is would help save us so much by being able to stock more at sale prices! Their phone app would be so wonderful for when shopping at the store to know what you have on hand at home! I think the app is the coolest part! I like that it is not too big for the home, and it looks stylish enough to leave out on the counter. I think that it is a great way to eliminate food waste! This looks like a very good system. It would surely save my family money! I think this is amazing, no more wasting food. LOVE IT! I like the reusable containers. I hate wasting plastic bags on vacuum sealing and I never dreamed I would be able to vacuum seal fresh fruit, so that’s cool. Also, I can’t wait to try this recipe it looks delicious. Have you tried subbing the almond butter for cashew butter? Wife can’t have almonds. The Homebase is pretty cool. I really like the overall design as well. I like the look of it, it would look a lot prettier on my counter than my current vacuum sealer. (Which has a habit of not completely sealing bags anymore…) The phone app is also a pretty neat feature! I love the simplicity and convenience of it! I love the way it looks, I wouldn’t mind having it out on my counter. I like its capacity, and that it can be used for daily storage also. I also like that it would allow me to buy in bulk and help with my grocery budget. I like that this system is so easy to use and can save me money! I like the fact that it reduces food waste and thus saves money. I like that it’s going to keep my foods fresh longer, especially produce. I like that it’s great for storing coffee beans, keeping them fresh for a very long time, without the loss of flavor. I love that the bags can be used to sous vide. I cook dinner for my elderly father every day, and since his diet is soooo different from everyone else I think individual sous vide portions could make my life easier. I like that it keeps food fresh longer. I made these the other night and they were amazing! My kids couldn’t get enough of them. Yay! So glad you liked them, Erin! My kid loves these too! Saving this for when I need a dessert for my gluten intolerant friends! These look scrumptious! I love the banana and walnut combo! After they cool a little bit, they should come down. Maybe you can use a little bit bigger baking dish. Hope they tasted great!